Sometimes it can feel like you and your client are on different planets. But you can’t seem to agree on what it should cost. It turns out there’s a very simple explanation for this. Psychologists call it the endowment effect. The endowment effect is the tendency for people who own a good to value it more than people who do not. Its economic impact is consequential. It creates market inefficiencies and irregularities in valuation such as differences between buyers and sellers, reluctance to trade, and mere ownership effects. Traditionally, the endowment effect has been attributed to loss aversion causing sellers of a good to value it more than buyers. Carey Morewedge, Associate Professor of Marketing at Boston University, explains how loss aversion plays into the dynamics between buyers and sellers. When we are buyers, not owning the good is the status quo so acquiring the good is a gain. When we are sellers, owning the good is the status quo so giving it up is a loss. Because we are loss averse — losses impact us more than equivalent gains — this difference in perspective leads us to value goods more when we are sellers than when we are buyers. In any sales transaction, the buyer is the one who stands to gain, while the seller is the one who stands to lose. That almost sounds counter intuitive. But think about it. A buyer will only decide to enter into a transaction, and thereby disrupt the status quo, if there’s a significant chance of gains. And the price they’re willing to pay is limited to the value of the gains they expect to receive. On the other hand, as the seller, you’re motivated more by the fear of loss than the hope for gains… because you’re the one who has to actually do the work. You have to put in the time and effort to create value for the client. You have to allocate precious firm resources and staff to work on the engagement. You have little to gain and everything to lose. So when it comes to fees, you’ll place a higher price tag on the deal… because you know what you’re giving up. #1 – Sell the benefits. Asking buyers to first think about the valuable attributes of the good they might acquire leads them to value the good more. Remind buyers what they stand to gain through your solution. 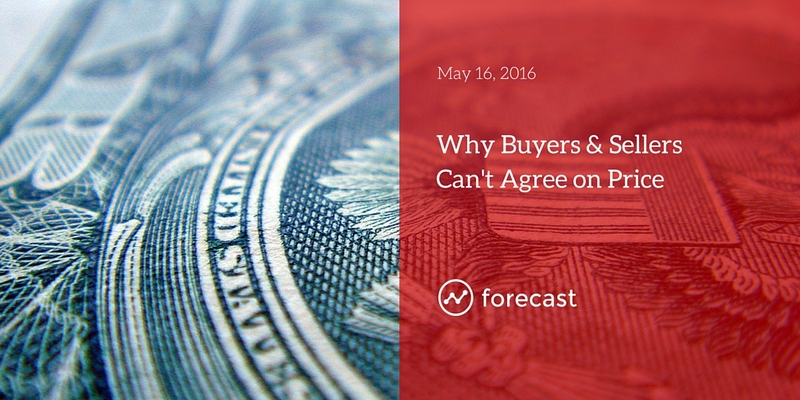 Buyers will naturally discount the value you claim to deliver. Your job is to mitigate the risks that are getting in the way of them fully appreciating your value proposition. #2 – Change the reference point. Another effective tactic is to change the reference price that people use to evaluate the good… When selling or trading a good, one might remind buyers of more expensive alternatives to what one is offering. What are the costs of inaction? Is the status quo really an option? The most potent alternative to engaging your firm is doing nothing. You need to make the case for why doing nothing is far more expensive than paying your price. #3 – Make it real. Get buyers to touch, hold, or imagine owning the good. Experiences like interacting with a product through a touchscreen, receiving a coupon for it, or temporarily being the highest bidder for it in an auction all have the potential to induce the endowment effect for the product if they make us feel like we own it. The more you can help buyers visualize the outcome, the better. Talk about clients who are already enjoying the benefits of your solution. Describe how your work has helped others and give your buyers the chance to see themselves in those stories. This post is an excerpt from the May 16, 2016 issue of Forecast, the weekly marketing newsletter for professional services leaders. Read the full issue here.